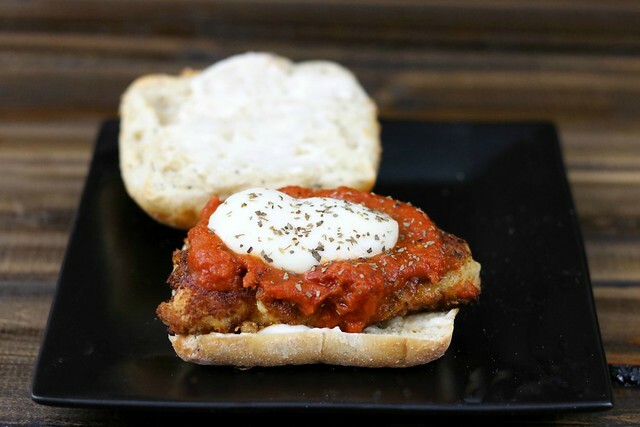 A great twist on an old classic, these Chicken Parmesan Sandwiches, pan-fried to perfection and topped with marinara sauce and fresh mozzarella, are just too good to miss out on! You guys. February is almost over and it’s like spring outside. It’s weird. And for me, hater-of-cold, to say that means it really is weird. Because…I’m not wishing for 30 degree temps or anything, but…come on now. It shouldn’t be nearing 80-degrees in February. Well, maybe if you live in Florida or some tropical area, sure. But, even in Texas – land of the unpredictable weather – it should be some form of cold, for at least a little while. Not five days since November. Okay, maybe a few more than that, but you get my point. I will say that I am thankful that the weather doesn’t make me want to keep my baby inside all day, erryday. I mean, I mostly prefer to stay home anyway, but…not because of the weather. Homebody, party of one, right here. When the weather is nicer though, and J isn’t working, I do have more of an inclination to get out and do things. I actually like to be outside. Hiking and such. But since the baby came along, trying to keep to a schedule has become increasingly important to me. Because if baby doesn’t sleep, we all pay the price. And, no thank you! Happy baby = happy mama. And you know the saying, “If mama ain’t happy, ain’t nobody happy.” And my dear husband can attest to this sentiment. Nobody likes a grumpy mama. You know what else nobody likes? Or at least J? A hangry wifey. Even my mama knows not to let me get to that point. If I’m talking to her and I’m grumpy, the first thing she will ask is if I’ve eaten. Ha! And J is always getting onto me about eating often enough. 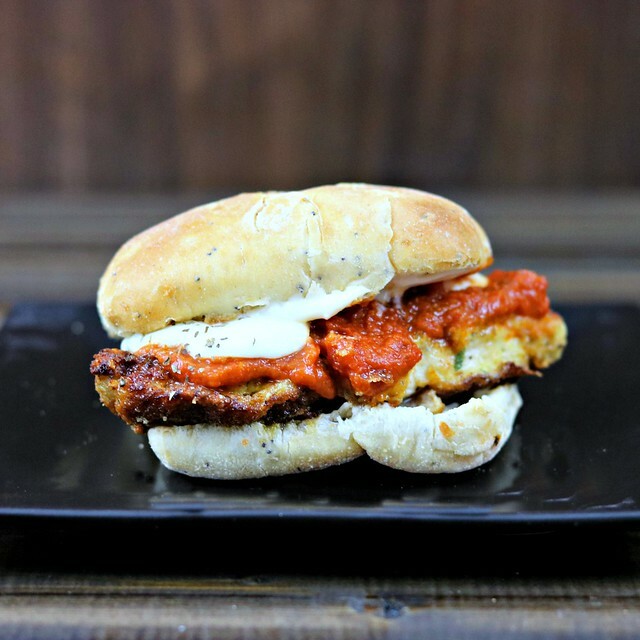 So, it’s nice to have quick and filling recipes like this one on hand, for when mama is tired and hungry, but wants a little more than a cold turkey sandwich for dinner. 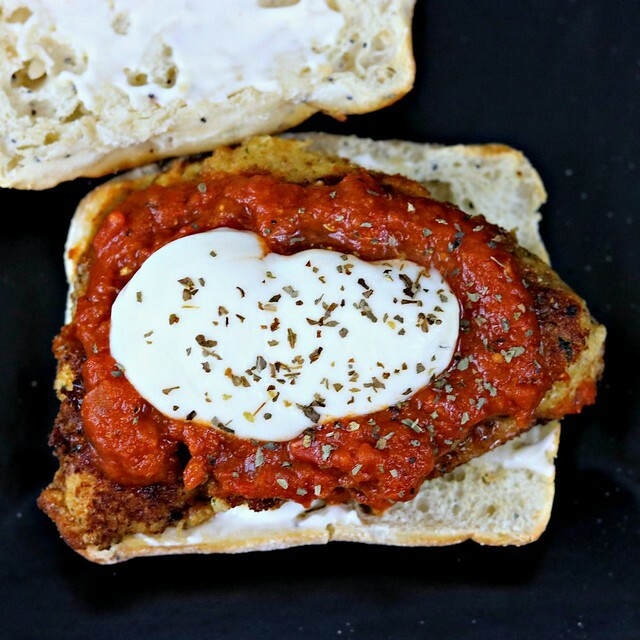 I had some mozzarella left over from the spinach mozzarella chicken roll-ups I made recently, and J is a big fan of the marinara sauce, so this seemed like a great way to use up some cheese, make the hubs happy, and have a delicious sammich for dinner. Wins all around! And while I am not one to deep fry things very often, I will occasionally pan fry, which is what I opted to do with these. I could have baked them, sure. But I wanted a nice crispy outside and moist inside. Which is exactly what I got. And just look at these little beauts, frying away in the pan. And if that right there isn’t enough to get the salivary glands going…then the ooey-gooey cheese will seal the deal. Amiright? And let me tell you this, friends. They bread matters. I will be the first to admit that J and I used to eat sandwich thins with most any kind of sandwich to cut back on how much bread we were consuming, but…no more of that. I mean, we will still use sandwich thins, but not for everything. Because…some sammiches need a good, hearty bread. Like the ciabatta rolls I’ve come to love recently. They aren’t too dense, but they are thick enough to keep from getting soggy. Because soggy bread is the. worst. And I assure you, there was not a hint of soggy here. Cut each chicken breast in half, length-wise, so that you have 4 thinner pieces. Season each piece with salt and pepper and set aside. Dredge each of the chicken pieces in the flour, shaking off any excess, then in the egg, and finally in the breadcrumbs, making sure to coat each side well. Place carefully into the pan and cook for 3-4 minutes, until nicely browned, then flip and cook another 3-4 minutes or until cooked through. Meanwhile, preheat your oven broiler. 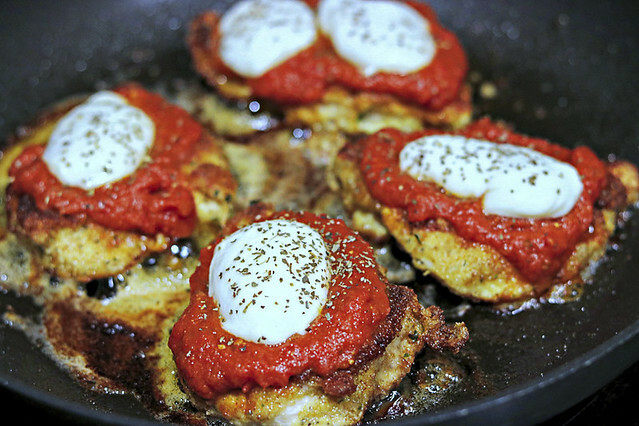 Once the chicken is cooked, top with ¼ cup of marinara sauce and a slice of mozzarella. Place under the broiler for just a minute or so, to help the cheese melt. *Alternately, if your skillet has a lid, you can place the lid on for a minute and skip the oven step. While the cheese is getting nice and melty, toast your rolls and smear some mayo or Miracle whip on either side. When the cheese is good and melty, sprinkle some basil on top and use a spatula to place each piece of chicken on a prepared roll, top it off and devour to your little heart's content!